how did i not come across this until now? 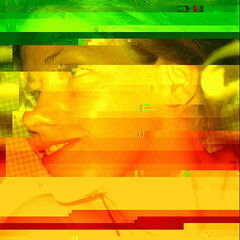 glitch art is a blog by tony scott (aka beflix). for four years, beflix has experimented with visual glitches, and has even collaborated with "big-name" glitch musicians like kim cascone. perhaps most interesting is the flat panel technique he's developed, where he makes photo prints of digital images by holding photographic paper up against his monitor. he's working on a book, too, full of submissions by other artists. (no publishing deal yet.) the deadline is past; too bad i didn't find this 9 months ago. i guess part of the reason i never heard of it is he uses the term "glitch art" exclusively. the term "databending" doesn't appear anywhere on the site—maybe he's never heard the term before? i only found the site because someone on del.icio.us had tagged it with a dataBending tag. Interesting! Though i wonder: why does the term glitch art only refer to visual art? I think there is such a think as glitch in music (as a genre) and thus also glitch art in for instance music?